Drowsy Monkey hosts the Mellow Yellow Monday meme. I've always wanted to photograph a Yellow Hummer. The other day I got my wish. Go visit Drowsy Monkey and check out her other participants. Very nice pictures. It reminds me of a Tonka truck I used to have. I didn't know what a Hummer was till I saw your photos! I thought it could have been a colloquial word for humming bird! Bright bright yellow collage! Looks good! I'd love one of those - I'd settle for just a long ride in one. I came looking for a yellow hummingbird,too, Mary! That is a bright, cheery color. That is the yellowist hummer I have ever seen. Perfect! What a great Yellow collage! I see a bright yellow hummer like this at least once a week in our Raley's parking lot. Always makes me blink and then I SMILE!! I won't even begin to say how much I detest Hummers - especially the yellow ones. BUT, I love your photos of it! I don't know about mellow, but it sure is yellow! Soon to be extinct at a dealer near you. Just visiting - can you belive the Hummer is now Chineese brand. May be they liked the bright colors it usually comes with :) Nice pics. Hummer is so cute! Great collage! I like all the different angles you put together. 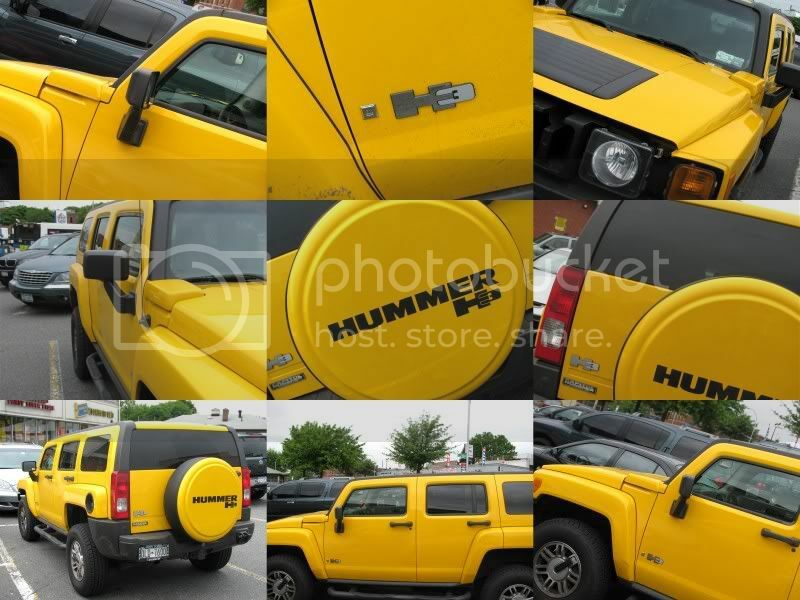 Your yellow Hummer collage has a pleasing graphic quality. I love the color and the shots. I can even confess to liking the car, it is an inanimate object that is not guilty of anything. But its manufacturers and owners should be liquidated. Cruelly too. Yellow ~ to me the color isn't mellow, but that's just me.